Price is $16.00. Ohio residents add Ohio state sales tax. You can download an order form by clicking here!!! Non-US orders must be through the Collinwood Shop above. Back Issues of the 2017 NYCSHS Calendar available. The price is $5.00 each. Ohio residents, sales tax is included. Back Issues of the 2016 NYCSHS Calendar available. The NYCSHS 2016 calendar is now available. Access to a wide variety of photograph collections enables the Society to again present an excellent selection of high quality images. On the front color cover, a Michigan Central passenger train powered by two F-M “Erie-Built” diesel units enters Illinois Central tracks at 115th Street, Chicago, IL for the 13 mile run to Central Station. 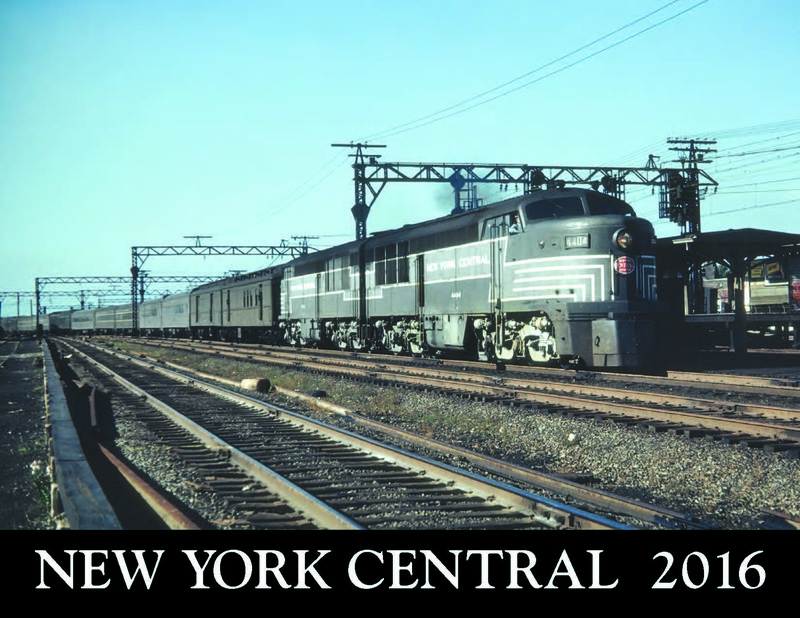 On the back color cover, EMD F-7 diesel #1787 leads a mix of NYC and PRR units on a Penn Central freight train in 1969. Calendar photographs include: EMD GP-40 #3038 heads a 3-unit set at Riverdale, IL (color); Class H-6a 2-8-2 #6374 at N. Chittenango, NY on the West Shore line; EMD E-7 passenger units at La Salle St. Station, Chicago, IL; Class J-3a 4-6-4 #5435 departs Englewood Union Station, Chicago, IL in 1947; Fifth anniversary commemorative event at Big Four yard, Avon, IN in 1965; Class S-1b 4-8-4 #6022 arrives in Chicago, IL with a mail train (color); Alco RS-3 #8276 with a commuter train at Briarcliff Manor, NY (color); Class L-4b 4-8-2 #3148 on a freight train in Anderson, IN (color); Class P-2b electric locomotive #224 at Harmon, NY (color); Class H-6a 2-8-2 #6143 on a freight train near Greenville, OH. The photo was taken from the diesel cab of a PRR freight train; New EMD F-7 units #1658 and #1657 at Bellefontaine, OH; Alco RS-1 diesel unit #8104 at Kingston, NY; GE U-25b #2543 and an EMD F-7 unit at Hennepin, IL (color). The price is $11.00 each. Ohio residents please add 88 cents sales tax. Back Issues of the 2015 NYCSHS Calendar available. The NYCSHS 2015 calendar is now available. Access to a wide variety of photograph collections enables the Society to again present an excellent selection of high quality images. On the front color cover, Class J-3a 4-6-4 #5405 is shown at the Elkhart, IN roundhouse in 1955. On the back color cover, two EMD E-units lead a westbound passenger train into Indianapolis, IN in 1961. EMD F-7 diesel unit #1778 on the “Old Road” passenger train at Bristol, IN in 1953 (color). Free Shipping!!!! Ohio residents add $.88 Ohio sales tax. 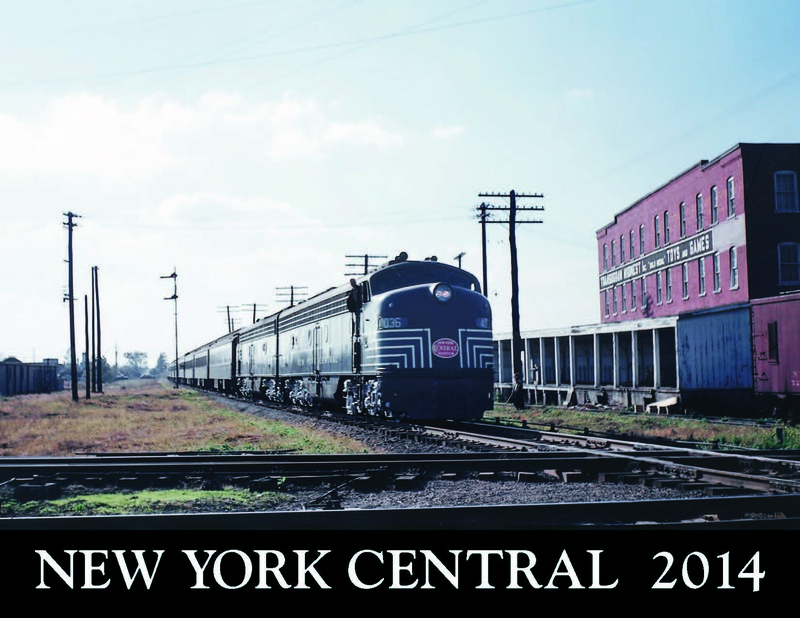 Get your 2014 NYCSHS calendar so you can keep track of all the happenings in the Society and see wonderful photos of the glory days of the New York Central Railroad. 2014 NYCSHS Calendar is now priced at $7.00. Free shipping. Ohio residents add $.56 Ohio sales tax. Here is your chance to access a wide variety of photos from the NYCSHS and private collections. 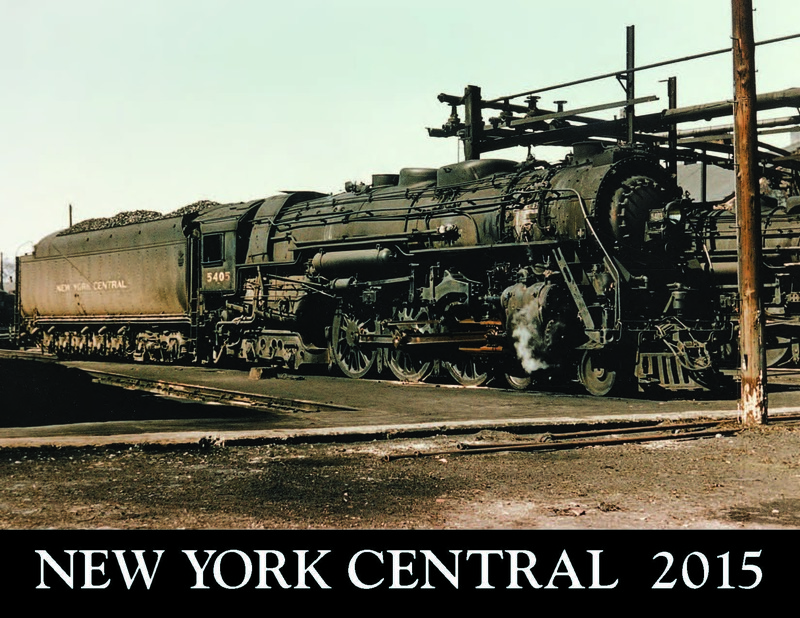 These are very high-quality images of several great NYCS subjects. The front cover, shown above, is of a pair of EMD E-8 diesel units arriving in Sturgis, MI with an excursion train from Elkhart, IN in 1951. The back cover shows a Class P-2b electric loco #224 in North White Plains, NY. Calendar photos include: three EMD GP-7 units on the James Whitcomb Riley in Indianapolis, IN in 1962 (color); Class J-1e “Hudson” #5333 on a passenger train in West Lafayette, IN in 1951; F-M H20-44 road-switcher #7104 at Collinwood, OH in 1956; Class H-10a 2-8-2 #2252 on an Evansville, IN – Mt. Carmel, IL freight; two B-L-H RF-16 units on a freight train at Huron, OH in 1953; a B & A Class J-2a 4-6-4 and Class L-3a 4-8-2 on the New England States at Chatham, NY in 1945; Class S-1b “Niagara” #6007 on display with the General Motors (EMD) “Train of Tomorrow” at the 1948 Chicago Railroad Fair; NYC diesel tugboat #34 on the Hudson River; Class J-3a “Hudson” #6002 on the Commodore Vanderbilt at Oscawana, NY in 1946; three BLW DR-6-4-15 diesel units power a freight through Erie, PA in 1948; a pair of EMD F-7 units take a westbound frieght train through Greensburg, IN in 1956 (color). Price is now only $7.00 each. Ohio residents add $.88 Ohio sales tax. The calendar may also be ordered at the NYCSHS “Collinwood Shop”. You can use PayPal to order it from the “Store”. We still have lots of past calendars available for purchase. Complete your collection today. Place your order with a check for $5.00 for each calendar ordered. Shipping included. Ohio residents add $.40 Ohio sales tax for each calendar. Or direct by clicking here for the NYCSHS “Collinwood Shop”.